The Autodromo di Monza is located in a beautiful park-like setting featuring century old forest trees and luscious green fields, offering ample shade and great picnic spots for the race goers. 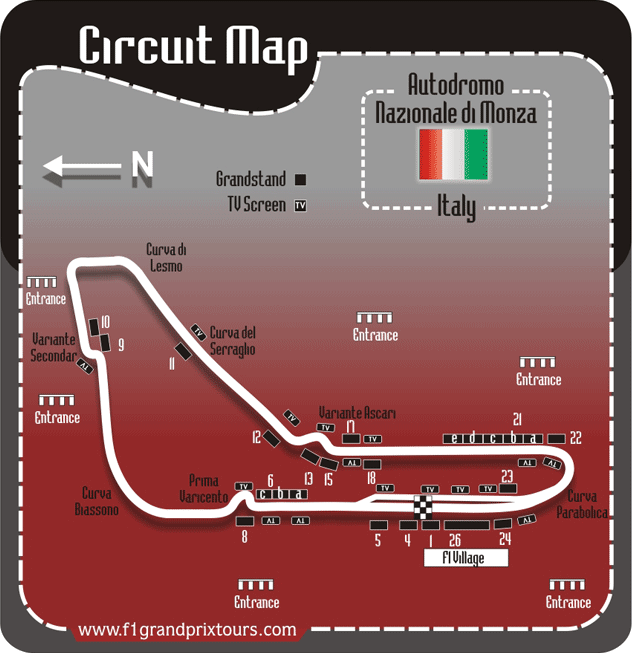 Detailed seating information on all Italian F1 grandstands is set out in the circuit maps below. The seating on 70% of all the grandstands for the 2019 Italian F1 Grand Prix are uncovered – it is therefore highly recommended to prepare yourself for all weather conditions e.g. sunscreen, umbrellas, hats, etc. All of the Italian Grand Prix grandstands offer bigscreen viewing. Usually tickets for the more popular Italian grandstands, like the Central, Lateral, Alta Velocita and the Ascari, grandstands tend to sell out first for the Italian F1 Grand Prix. Before considering the most appropriate package that best suits your 2019 Italian Grand Prix needs, it is important to consider the location and benefits of the available grandstand and general walkabout tickets. We suggest that you refer to the attached circuit map, to further assist you in making the best possible choice. The Autodromo di Monza currently has a total capacity for 114,000 spectators, which can be accommodated in both the 23 grandstands and its various general admission areas. All grandstand seats are numbered but only 6 grandstands (Central, Right and Left Lateral, Outer Ascari Sector A, Parabolic and Vedano) are covered. On Friday seating is open on all grandstands (with the exception of the Central Grandstand) to all ticket holders. The uncovered grandstands can become rather hot in the sun and seating on the edges can sometimes be limited by an obscuring tree line. The general admission areas offer good viewing at Monza, featuring numerous unnumbered concrete stands well shaded by the majestic old forest trees. Good disabled facilities are available on the Vedano Grandstand and access to the circuit is free for all wheelchair-disabled spectators for the duration of the Grand Prix. There are sufficient toilets and catering facilities all around the track. There is ample opportunity to buy merchandise, with a number of stalls inside the circuit, and a few unofficial ones on the outside. The Monza Main Grandstand is located on the Pits Straight directly opposite the start line and just after the end of the pit boxes area. It offers you with an excellent view of the build-up to and of the start of the race, as well as a view of some of the lower racing teams and their pit activities. The podium is however not really clearly visible from this grandstand. This grandstand is also located on the Pits Straight, just after the start line and the some distance from where the pit boxes end. This grandstand will offer you a slightly distant view of the build-up to and the start itself, as well as the pit lane exit. With a pair of binoculars it will be possible to see some of the pit lane activities as well. A bigscreen located opposite this grandstand, which makes your Grand Prix experience so much more enjoyable. The uncovered Piscina (swimming pool) grandstand is situated on the Pits Straight opposite the pit lane exit. It will offer you some views of the build-up to and the start (although rather distant), as well as good views of the pit lane exit. Taking along a pair of binoculars is recommended for this grandstand. The grandstand also features a bigscreen TV, which for obvious reasons makes your entire Grand Prix so much more enjoyable. All 3 these uncovered grandstands are located at the end of the Pits Straight, just before the First Chicane (Prima Variante), the fastest section of the track. In this section the cars reach speeds of up to 360kph in 6th gear, before braking very hard for the very tight, 70kph, first gear chicane. Braking is at over 4G for this chicane, which makes it an excellent place for passing. Stand C is without a doubt the best option of the 3 stands and offers excellent views of the First Chicane. The uncovered Outer Variant Grandstand is located at the end and outside of the Pits Straight, just after and on the outside of the First Chicane (Prima Variante) the fastest section of the track. In this section the cars reach speeds of up to 360kph in 6th gear, before braking very hard for this very tight, 70kph and first gear chicane. Braking is at over 4G for this chicane, which makes it an excellent place for passing. Depending on where you sit, views of the cars coming down the Pits Straight can be obscured in some places by the tree line. These two uncovered grandstands are located just after the Second Chicane (Seconda Variante). The cars accelerate after the First Chicane up to 6th gear round the Curva Biassono, which is taken flat out, into the Second Chicane. It’s quite a bit faster than the First Chicane and is taken around 115 kph in second gear. The kerbs are much higher here and the cars bounce off them a lot more, so the drivers require a lot more car control. Because of the hard braking into this chicane, it is another possible overtaking spot. A good option, but prepare yourself for a fairly long walk. Both grandstands offer good viewing, but Grandstand 10 offers you a longer view of the cars, while Grandstand 9 is closer to the chicane. A bigscreen TV is also located opposite these two stands, enabling you to follow the entire race and not loose track of the procedures. This uncovered grandstand is located on the inside of Serraglio Corner, which is more of a left hand kink than a corner. It is taken flat out by the drivers in 6th around 330 kph. From this grandstand you can see the cars as they exit from the second Mesmo Corner, but not much once they have passed the stand, because your view is obstructed by the tree line. Not one of the best options from a grandstand point of view and a fairly long walk from the main entrance gate. The 3 Ascari uncovered grandstands are located just before (Ascari 3), in the middle of (Ascari 2) and at the exit (Ascari 1) of the Ascari Chicane. At the end of the long narrow Serraglio back straight the cars reach 335km/h in sixth gear before the drivers brake hard for the Ascari chicane, dropping to third gear and turning left to take the first part of the chicane at about a 140km/h. They then turn into the right-handed section at about a 180km/h, before they immediately turn left again to exit the chicane. The Variante Ascari is the fastest chicane on the Monza circuit and the drivers must drive over the kerbs and use all of the circuit, to carry the highest possible speed into the next long straight that leads down to the Parabolica. The Ascari grandstands offers good viewing of the whole Ascari Chicane as well as the two straights ending into and starting from the chicane. The stand is not to far(short stroll) from the F1 Village and other facilities., but an obscuring tree line on some of these stands can limit your view. Two bigscreens opposite these grandstands intensifies the drama and magnifies the action on other parts of the circuit. This uncovered grandstand is located on the outside of the circuit, just after the Ascari chicane and offers you a view of the cars exiting the Ascari Chicane and accelerating down the back straight. Unfortunately it does not present you with a view of the cars entering and passing through the Ascari Chicane and you can only observe the cars from when they exit and down the back straight up to the Bridgestone Bridge. It is also a pretty long walk to get to this stand from the F1 Village and pits area. This is one of the few covered grandstands around Monza and it is located on the inside of the circuit just after the Ascari Chicane. It offers you views of the whole Ascari Chicane, although possibly a bit distant, as well as views of the cars racing down the back straight up to the Bridgestone Bridge. The stand is not to far (a short stroll) from the F1 Village and other facilities and will make life a lot easier should it start raining. These four uncovered grandstands are located on the outside of the circuit just before the last corner of the circuit. These stands offer you views the cars racing down the back straight, where they can reach speeds of up to 350kph, which then have to be reduced to about 165 kph for the Parabolica Corner, a very fast 3rd gear corner. It is a long walk from the pit area and F1 Village to these stands, but a bigscreen TV is located opposite these big stands. This covered grandstand is located on the outside of the circuit, just after the Parabolica Corner entrance. From a drivers point of view, the Parabolica is one of the nicest corners on the Monza circuit This right-handed corner is fast, very long and very important, because it ends and starts a lap. For Monza the cars are normally set up with low downforce, so there is always a good possibility of them either oversteering or understeering through this (high downforce) corner, which can sometimes make for some very interesting viewing. This grandstand offers very good views of the cars as the come down the back straight, up to about halfway around the Prarabolica Corner. It is once again, a long walk from the pit area and F1 Village to these stands, but a bigscreen TV is located opposite the stand. The uncovered Inner Parabolica Grandstand is located on the inside of the circuit just after the exit of Parabolica Corner, a very fast third or fourth gear corner with a protracted exit, taken at close to 200 kph. At the exit, drivers will be getting on to the power as early as possible, drifting the cars to come out on the very outside of the corner exit. The grandstand offers good views of the Parabolica Corner exit, the pit lane entrance the finish line and Pits Straight. This covered grandstand is located on the outside of the circuit just after the exit of the Parabolica Corner, a very fast 3rd gear corner with a protracted exit, taken at close to 200 kph. At the exit, drivers will be getting on to the power as early as possible, drifting the cars to come out on the very outside of the corner exit. The grandstand offers good views of the Parabolica Corner exit, the pit lane entrance the finish line and Pits Straight. The podium is also visible from this grandstand although a bit distant. The grandstand offers facilities for disabled spectators and provides ramps and toilette facilities for wheelchair access. Please note however the disabled section is not covered. The Right Lateral Grandstand is a massive covered grandstand, located opposite the pit boxes, podium and finish line. This grandstand will offer you good views of the pit lane activities, the podium celebrations and the race finish. The grandstand will also offer you views of the build-up to and race start from the back of the grid. The F1 Village is conveniently located behind this grandstand and it is not to far from the circuit entrance. This grandstand is massive so choosing the best seat is very important. A bigscreen TV is also located here, enabling you to follow the entire race and not loose track of the procedures. The general admission areas, provide for excellent viewing and offer great value for money admission at Monza. You can choose to view from numerous areas around the circuit, which include raised viewing areas (mounds) and small (3-4 rows) shaded stands, located around the inside of the track. Most of the general admission areas is however a long walk from the F1 Village and pits area. The areas bring you really close to the action, and also provide easy viewing access to disabled spectators. But as always there are no numbered seats and you must be there early to get a good spot, which you stand to loose should you have to visit a toilet or leave to buy food. Don’t forget to bring along some fold-up chairs. In terms for good photographic opportunities, the best grandstand is probably Alta Velocita C, and Outer First Variant, where the cars slow down substantially and pass closer to the grandstand areas. The same goes for the Ascari One and Two grandstands. For obvious reasons the Right Lateral grandstand will provide you with numerous good pits and start line scenes, but cars roaring down the Pits Straight at nearly 330 kph, makes good photographic shots more problematic. Fortunately all weekend tickets will give you free access to all the grandstands (excluding the Main Grandstand) for Friday, which will provide you with an excellent opportunity to visit all the above grandstands and to take some hopefully great pictures. The F1 Village is located behind the Right Lateral Grandstand area and fan merchandise are on sale within this area as well as some interesting displays from the tire manufacturers and other F1 related suppliers. It features pleasant grassed areas, with a variety of mobile food and drink units. The F1 Village is accessible from every grandstand. Food and beverage With numerous mobile catering units positioned around the circuit, a vast range of food and drink is on offer to the race-goers. Prices range from €3 for a panini sandwich, €6 for pasta, €9 for a pizza, €4 for a cold beer and €2.50 for bottled water.